I took three creative writing classes in my bachelor’s, and I plan to take more with an associate’s–because: overachiever. (Yeah, I’m crazy enough to spend money on something that I can read online. That’s because, in all three courses, I loved the class format. 80% of the class was writer’s workshop. There are so many workshops and writing circle variations; as a writing teacher, I’ve tried many of them. You can only imagine reading 150 teenager-written short stories than trying to get them to talk about it. 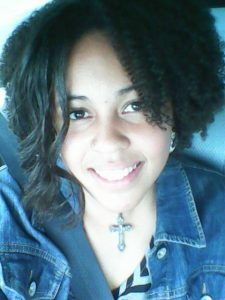 I’ve never known a writing activity to be as powerful and productive as those I had in college. Being involved in the writing community, I’m trying to attend more write-ins and workshops to work with others. I miss the conversation and mature feedback. I love improving as a writer and challenging myself with positive critique. Plus–the teacher in me really–I like helping (not judging) others improve, too. The online critiques just aren’t consistent enough. While you may get a few people who answer, many times, you’ll get no more than that. Having conversation is really a no-go. We’re all too busy even though we bother with social media (that ironically isn’t social at all). 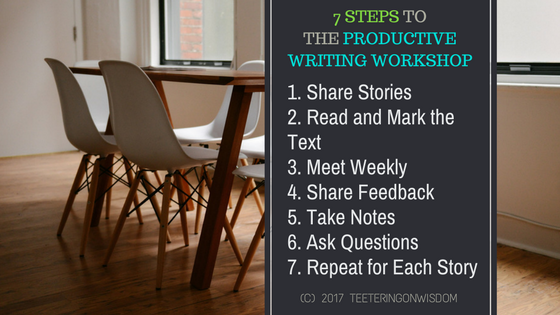 We need to carve out time in our week for that focused writing community time. For us to really make our communities stronger, we need a consistent and productive way to share and respond to writing. Here are the steps for the magical workshop that helped me grow to be the writer and writing teacher I am today. 1. Share work with everyone before the meet-up; 3-4 stories per week. Each week, 3 authors will share their stories with the group, either digitally or on paper. On paper (that the author will provide) is recommended because the readers will pay more attention to the work and mark the text. Have no more than 4 stories a week; that way, we all have time (7 days) to read and mark each text to talk about it at the weekly meeting. 2. Make notes and ask questions as you read the designated stories. As you read the submitted stories, mark the story and comment on the quality of the story, not the writing (that’s editing). Ask questions, make predictions, read it like a reader and writer. Make sure you are ready to contribute to the conversation. The story author should do this, too. 3. Meet up with story and notes ready to share. When it’s time to meet the group, everyone should have read the story and made appropriate notes to contribute to the conversation. You want to get the group in as close to an open circle as possible; facing one another fosters more genuine discussion. 4. Share the strengths and weaknesses, notes, suggestions, and questions related to the story. The moderator of the group should identify with which story you’ll all start. The author will give a quick summary of the story to jog everyone’s memory and make clear the intended story. NOTE: if the author is not there, no discussion should be held about his/her story until (s)he is present. There is no particular way to start a Socratic seminar in this fashion. It should resemble a normal conversation going over the strengths and weaknesses, with each person adding when appropriate. Try to make eye contact with the author when possible. Be honest, but make sure to have positive and negative things to share. 5. The author should be taking notes during this time without any words. Here is where it gets hard for writers. We want to correct others, we want to defend our work, we want everyone to love it from our eyes. Nope, you have to take in every word and make a note. The author should strictly be listening–not speaking at all. Even if the story was misunderstood, make note that you may not have been clear on that part in the story. Catch as many questions, comments, and suggestions as possible. 6. The author can ask questions and get answers in real-time. Now the author can speak. Once everyone has pretty much shared, this is the author’s chance to answer questions and get suggestions on how to make that happen. (S)he can ask questions about struggles (s)he had when writing and get clarification about comments made. With others present, there is more support for the writer and the readers who need help sharing their thoughts in a clear manner. Because it’s all real-time, there aren’t any gaps in memory and interest. 7. Repeat with each story. The moderator should try to keep time and keep each conversation to no more than 45 minutes so there is time for the others. Rotating to each story, the process should be repeated. Then, before the end of the writing session, the next 3-4 stories should be shared for the next weekly meeting. It’s so simple, and yet, rarely done. The key is that we don’t waste time during the discussion with reading. You want to come with the story being read already so we can focus on how to make it better. It’s okay if there are new people who didn’t read. Have someone share a full summary so the new members can give overall commentary on the story structure. 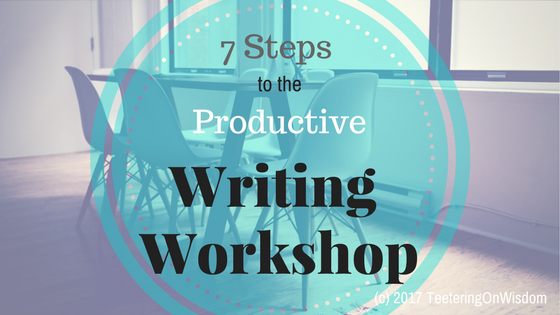 I feel like, if we alternate and practice similar workshops to this one, we’re more likely to grow as writers. Now the hard part: a place to meet. Actually, the beauty of this workshop type is that you can meet in person, but you can also meet in the document together. If everyone is somewhere different, the authors can share the Google doc (the easiest way to pull this off), the group can agree on a specific time, then everyone can comment, ask, and answer questions right on the document in the same way. This way, the notes are also digitized for the author, and new members can read along the way and join in. So, what do you think? Do you think this could work? Do you have any suggestions about it all? Comment about it below or on social media. While you’re here, I suggest you sign up for the bi-weekly Writer’s Wisdom newsletter and get your free access to writing and writing teaching resources. 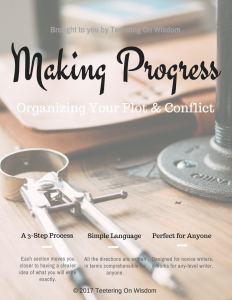 The plot organization workbook is now available!